I've been doing a lot of screenprinting with fashion and textile students lately. such as Permaset, Supercover inks are opaque on dark colours, fully washable and can be ironed. for a finer pattern or line, a 60-77T will give more detail but ink dries in the mesh quicker. 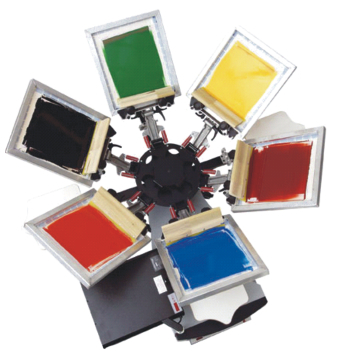 multi-colour images may be printed using a carousel or automated machine. A splash of good design and/or colour can really make something plain into something exciting. Many designer's or art student's first print on fabric is a t-shirt design. These can be funny, political, arty and/or fashionable. If done well, printing on clothing can transform it into a statement of personal style. Think about placement - maybe a corner, one panel, or take over the whole item! Cultural designs can be worn as a statement of identity. consider a print for the whole garment. which can be printed individually or in combination. 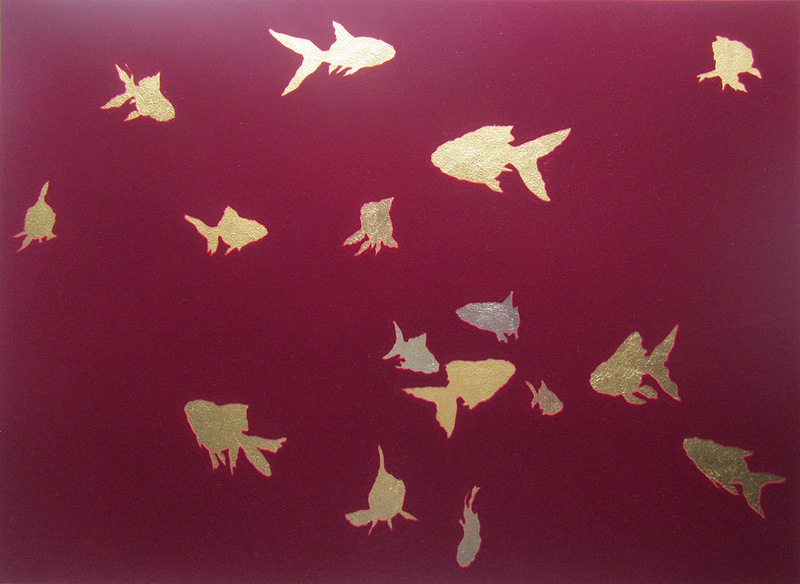 such as gold foil and flocking like these great works by Kelvin Mann (NZ/Ireland). If you have access to digital printers, there are transfer papers for fabrics. Simply print on the paper and transfer it by heatpress to the fabric. also for any job too difficult to screenprint. On pieces or finished garments. Available from Heat Press Media, either for white fabrics, or opaque for dark fabrics. (or it can be used to make hand-cut designs too if you have the inclination). These products are fixed onto the material using heat, very versatile prints for fabric. So many options!!! And so many possibilities of how you can use the fabric! I'd love to know about your current projects. Either post pics on NZ Printmakers' Facebook page, or click here to email me. i use loads of the techniques you have mentioned, as well as the inks you recommended. Great article! !